I have dedicated the last 17 years of my life working with young children in various school settings, by implementing my educational philosophy. I believe in providing a secure environment where a child can develop the learning skills and self-confidence necessary to be prepared for further education. It is my belief that children learn through a wide array of modalities, especially by playing and interacting with their peers. I believe children should be provided with self-directed activities that allow them to discover their own uniqueness, as well as allowing them to achieve success without pressure. I strongly believe that it is crucial, in the development of a young mind, to create an environment where each child's level of cognitive development will be represented and challenged. It is my intention to utilize my education in the field of early childhood education and applied behavior analysis, along with my business management skills, to make Heart 2 Heart an outstanding Child Care Center. I have been fortunate to have extensive work experience in challenging and constructive environments. I appreciate the opportunity of becoming a part of your child's life of learning and I'm looking forward to making your family part of Heart 2 Heart’s Family. Staff - The Center staff consists of an Executive Director, Assistant Director, Lead Teachers, Assistant Teachers and Aides. Each group operates with a team including a lead teacher and/or, assistants and aide (ratio dependent). Staff members are certified in First Aid and CPR. Lead teachers must have either a degree and experience in ECE or experience and CDA certification. HOME AND SCHOOL CONNECTION - Meaningful family engagement in children's early learning supports school readiness and later academic success. Parental involvement is a critical element of high-quality early care and education. Heart2Heart offers families many opportunities to engage in their child’s Heart2Heart passage with special holiday family events, concerts, field trips, and classroom involvement. PLAYGROUND – Our outdoor play area is fully gated and designed for safety and security. 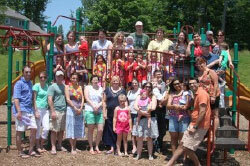 It offers developmentally appropriate play spaces – separated by age groups. In the summer, our playground transforms into a “water park” – featuring sprinklers, (water slide for older children), water table, and sand castles! ENRICHMENT – An important aspect of our Programs are the added, age-appropriate enrichment. We offer monthly field trips for our Pre-School and Pre-K students to complement the themed-learning curriculums. Toddlers and Waddlers participate in a few of our field trips – age appropriate. Parent Chaperones are invited and encouraged to accompany their child’s class on field trips. SAFETY AND SECURITY – Heart2Heart is a locked facility. The playground is fully gated. Children are released only to authorized individuals. Our staff is CPR and First-Aid trained. The Center is MAT Certified (Medication Administration Trained). Our Center has fire drill procedures in place, as well as stay-put, lockdown, and emergency evacuation plans. OPERATING HOURS - Heart2Heart is open year round, closing primarily for major national holidays. At the beginning of each school year, a calendar is published, allowing parents to schedule accordingly. The Center is open five days a week from 6:30 a.m. – 6:30 p.m.
Programs -Passing on the Love of Learning . . .